CyberStockroom is an online inventory management and tracking software solution built for businesses that need more inventory visibility. Our clients include distributors, wholesalers, and retailers from various industries. We built it from the ground up to be simple, intuitive, and user-friendly. 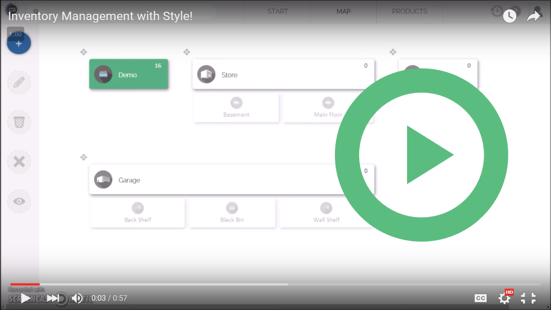 It uses a novel map-based approach to organizing inventory that makes it extremely easy to learn and use. CyberStockroom is the fastest way for businesses to start tracking and organizing their products and locations. The CyberStockroom logo is a stylized "Map Pin" with the letters CS enclosed within it. It represents the map-based features that set CyberStockroom apart from other inventory software. The logo is sometimes displayed vertically and other times with a 27 degree counter-clockwise rotation. CyberStockroom was founded in 2011 in Ottawa, Canada. The company employs a remote team of developers, designers and salesforce and has clients in Canada, USA, UK and Australia. CyberStockroom was founded by Emad Hanna. His experience ranges from developing obstacle detection systems for unmanned aerial vehicles to building motion-controlled entertainment systems for the NHL, NBA and the NFL. Since 2015 he has been advocating for the implementation of radically better inventory visibility across the supply chain.